iPhone sales exceeded analysts' expectations while millions of people purchasing a new Apple smartphone are switching from Android devices. 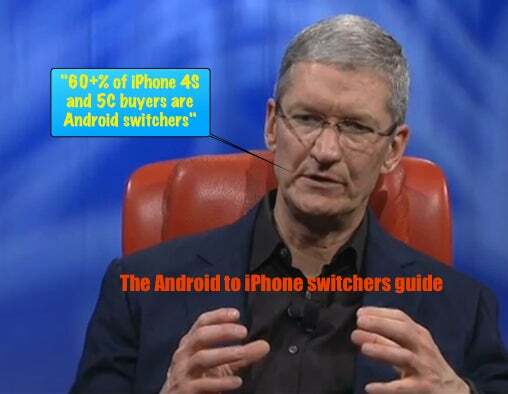 If you are an ex-Android user thinking of switching to iOS, this short guide should help you enjoy a smooth transition. Getting around Apple's iOS is pretty simple. If you've just picked up a new iPhone, then all you need to remember is that if you ever get lost, all you need to do is tap the Home button (the big button at the bottom of the device) to get back to the main menu. It's also worth swiping your finger up from the bottom of the Home screen to explore Control Center, where you can securely adjust some of your iPhone's settings. To get best use out of your iPhone, you'll need to set up an iCloud account. You can use this in Apple's iTunes and App stores, and also access free productivity software via www.icloud.com. There's an excellent guide to setting this up here. Security matters. If you've been using Android devices, you've probably read the many scare stories about it in comparison to iOS. If you've been using an Android device, you're also probably used to receiving infrequent security and software updates because your carrier or device maker hasn't made them available for your device; things are different on iOS. Apple frequently issues software patches to all current devices. To check whether there's an update available for your new Apple device, find and tap the Settings icon, then tap General>Software Update to find out. If one exists, you'll be told. Because it isn't in thrall to carriers and device makers, Apple is able to swiftly issue software updates to current iOS devices. This is why malware writers target other platforms. iPhones are secure against the Heartbleed flaw, unlike many Android devices. Android users may miss the ability to explore different stores in order to purchase and download apps, but given most security experts recommend they only acquire apps from Google Play/Amazon, many users won't miss a thing. Android users switching to Apple can still get apps, but only from Apple's own App Store -- just tap the App Store icon to explore what's available. You may need to purchase/download your favorite Android apps again, but it is sometimes worth contacting the software developer to explain you already acquired their app for Android and now need it for iPhone -- so long as you have a purchase invoice to prove you didn't grab it from one of the "free" app sites, some developers may offer you a free install of the iOS version. Now that you've got a shiny new iPhone, you will certainly want to port your own personal data across from your dusty old Android device. The good news is the process is fairly straightforward -- I have a simple guide to the process right here. Apple offers a free book, The iPhone User Guide, to help you get a grip on your new device. It's written in plain English and has clear and useful images and is designed to help you quickly figure out what your new device can do. Available in PDF, you can also get the book using the iBooks app on your iPhone. Press the Home button and flick through the pages on your Home screen to find iBooks, tap the app and then tap Store. At the bottom of the screen, you'll see a magnifying glass icon marked search, tap this to enter the search field and type the book name to find the book. (An iPad guide is also available).